This I think is an ivory scrimshaw, possibly Mammoth. I believe it was scrimshawed at one time and has lost it’s scenes. It has brass inlay maybe the points of a nautical compass, all the parts are segmented together. I would love to know if all my learning about antiques is paying off. I have collected antiques across the board for over twenty years. This is possibly an ivory scrimshaw item, and I picked it up at a car boot sale. Hi, I have found out that these "scrimshaw" boxes are actually made of bone, probably water buffalo or camel, from India. They are not antiques, but are just made to look old. If you search eBay under “bone trinket box” you will find pieces that are very similar, with the same latches, hinges, and joining together of bone. These pseudo Ivory Scrimshaw items sell on eBay for around $20.00. Sorry to say, not real antique scrimshaw. Hi! 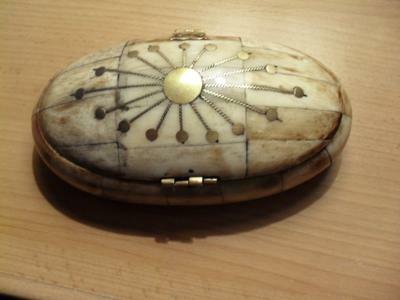 I recently acquired an antique scrimshaw box very similar to the one pictured here, with the brass compass or wheel inlaid on its top. There sure aren’t many of these around, as I’ve Googled & checked out dozens of scrimshaw collections and dealers. Since yours is so similar, I wanted to ask if you’ve found out anything else about it, such as its value, where its from, time of its making, etc? Thank you for your time & any info you are able to provide. Do some research on your particular sample of Ivory Scrimshaw. They are fairly common and can be found with some searching on the net. Usually made in Pakistan from camel bone. I have one. Very crudely made but unique and interesting on its own. Not ivory scrimshaw at all. Don’t pay over 20 bucks for one and I’m being kind.